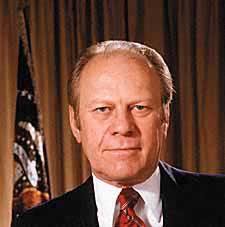 President Ford died last night at the age of 93, the oldest President ever. He was the first President I ever voted for (by absentee ballot, since we were getting ready to move to the Deep South at the time). Since I lived in Michigan, it was like supporting your home team. He was the most average of Presidents, no glitz about him at all -- plain spoken, hard working, honest, direct, and pretty humble as Leaders of the Free World go. But he had this bad habit of falling down while cameras were rolling, and comedians made unending fun of it. Chevy Chase based his career on it. But the little secret everybody knew but ignored was that, in reality, he was probably the best athlete of any President. Nobody cared; President Ford was so plain and pedestrian in the way he spoke and acted that the idea of a stumble-bum Chief Executive seemed to fit. And after Nixon and Watergate, you wanted a President you could wear lightly. Whenever I think of the 70's I automatically think of President Ford; the 2 are linked in my mind, not just because he happened to be President then but because he anti-embodied the '70's by being so preternaturally square. And he knew it, and embraced it. After all, despite the fact that Ford imitators were constantly falling down in flamboyant fashion on the show, what other President would announce from the White House, "Live from New York, it's Saturday night!" (Nixon famously asked, "Sock it to... ME??" during his '68 campaign; the vibe was completely different). My generation was moving on from Hippies to Disco and Glitter Rock. Somehow Gerald Ford seemed to be the perfect one to preside over it all.